Timeless, sleek and stylish, there’s a reason why stainless steel is the go-to cookware for many. It’s durable, easy to cook with and affordable. Buying a complete set of cookware rather than piece by piece can save you big bucks. But with all the stainless steel cookware out there, how do you know which one is right for you? It took some time and a whole lot of cooking, but we’ve come up with the best stainless steel cookware sets that will set you and your kitchen up for meals to come. But before we get to the list, how do you know which set is right for you? And how do you cook with stainless steel? Keep reading to find out! What Makes Stainless Steel so Great? There are many reasons why stainless steel is so great, but here are the top reasons why you might want to consider getting a stainless steel cookware set for your kitchen. It’s durable and easy to care for. Stainless steel cookware is pretty easy to care for and most sets can hold up to the dishwasher. 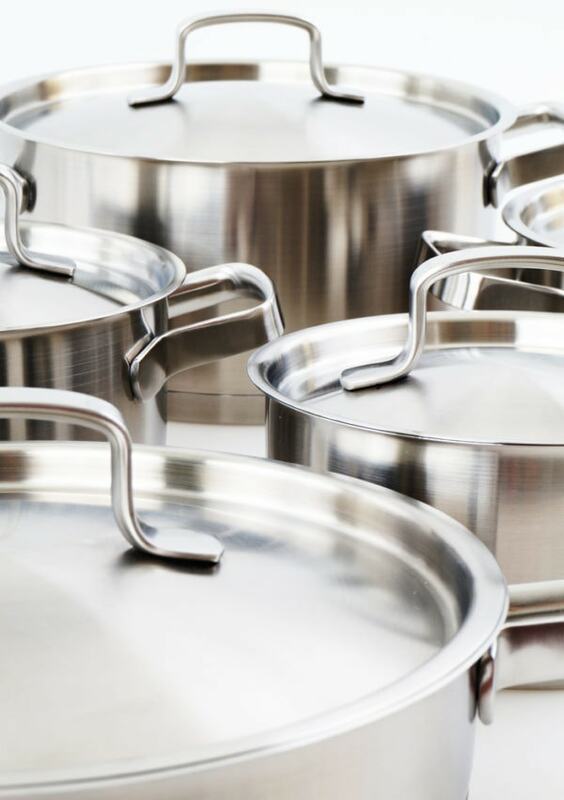 While there are a few things to keep in mind, stainless steel does not need to be polished like copper or always hand washed like some nonstick cookware. It heats up quickly and stays hot. You won’t need to wait around for your pan to preheat. It heats up very quickly and stays hot when using a medium heat setting on your cooktop. That said, have your ingredients ready to go before you preheat your pan! It is usually magnetic which means you can use it on induction cooktops. Finding a pan that works on induction cooktops can be tricky. Luckily, many stainless steel pans work great on induction cooktops. That being said, there are some that do not work on induction cooktops. The ones on this list that do and do not work on induction cooktops are noted. There is no doubt the smooth silver look is a stylish one. While looks may or may not be the deciding factor on whether or not you purchase stainless steel, it doesn’t hurt to have a cookware set that looks good. Before you start frying up a chicken breast or sautéing some onions and peppers, there are a few things you should know about stainless steel. Make sure it’s preheated correctly. How do you know? Put a few drops of water in the pan. If the water droplet balls up and rolls around the pan, you are good to go! Have all your ingredients ready. Once it’s hot and ready to go, cook right away. A good way to ensure that is to have everything within arms reach before you preheat. Add your oil after you preheat. You only need a small amount. Once you add the oil, start cooking. If a recipe calls for high heat, start with medium-high first. Stainless steel gets hot and stays hot. So adjust recipes and start your temperature just a little lower. It’s highly suggested that you never heat a stainless steel pan greater than medium-high heat. Before using a stainless steel pan for the first time, be sure to condition it. That simply means rub about a teaspoon of vegetable oil on it. Repeat this every 2-3 months to ensure food doesn’t stick to the pot or pan. * Tip: Don’t put that hot pan under a faucet to cool it down! This will warp the pan. Let the pan cool down on its own before washing it. Most stainless steel cookware is dishwasher safe. If at all possible though, go ahead and hand wash and towel dry them. Why? Because stainless steel pans can spot. If that happens, don’t worry. Just buff out the spot with a soft cloth and some white vinegar. If you need to scrub off some stubborn food or stains, be sure to avoid metal scrubbers. If you have some stubborn spots to clean, use some baking soda and a non-metal scrubber to get it off. Here we have a list of the 10 best stainless steel cookware sets. 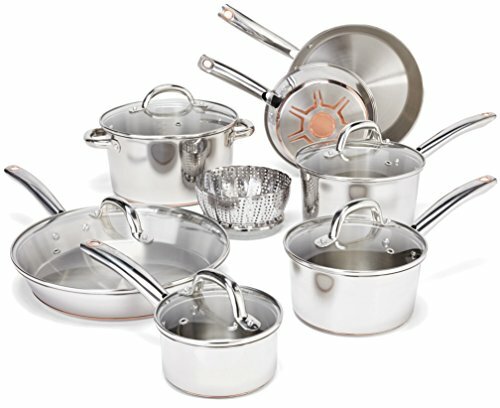 Most of the sets, such as the Cuisinart, Calphalon, T-fal and more, will fit your budget and last for years to come. 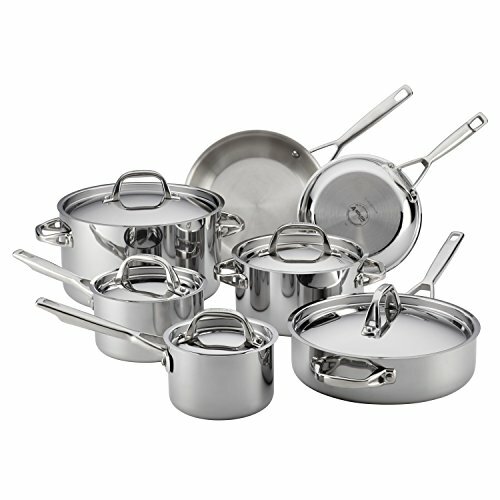 With so many stainless steel sets on the market, it’s hard to determine which one is the best. We break it down to make it easier to choose the right one for you. 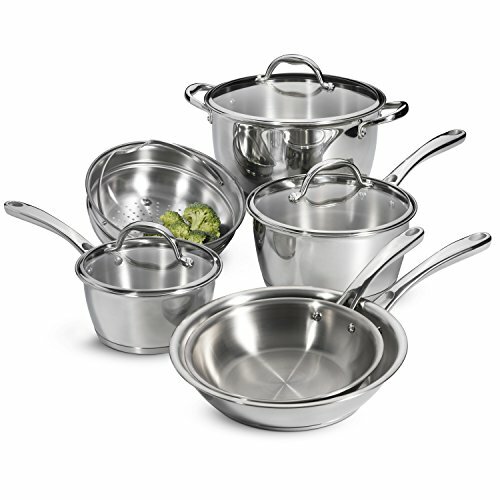 Each set has their pros and cons, but all the sets will give you a great stainless steel cook experience. This cookware set has everything you need for your kitchen. It comes with 2 saucepans, 2 skillets, a saute pan, stockpot, steamer insert, and lids. Each piece has a tapered rim to prevent any drips when pouring. 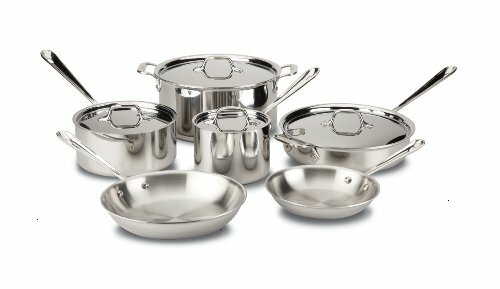 The solid stainless steel lids make a tight seal and all the pieces in this set, including lids, are dishwasher safe. If you have an induction cooktop, this set is compatible. As far as cooking goes, it has a tri-ply construction with an aluminum core for max heat conductivity, meaning it heats up fast without any loathsome hot spots that can cause food to stick or uneven cooking. Everything can go in the oven as it is oven safe up to 550 degrees. For 12 pieces, this set is very affordable and sure to last a long time. 12-piece set has everything you need at an affordable price. Aluminum core allows for even cooking. Dishwasher safe and oven safe up to 550 degrees. The pan may warp if heating over medium heat. This sharp looking set has a secret on the bottom: copper. Copper is superior when it comes to heat conductivity, but an all copper set can be pretty expensive and a little harder to maintain. Luckily, this set mixes the best of both stainless steel and copper. Despite the copper bottom, caring for this set requires no special maintenance. This set comes with 3 fry pans (the 12” inch size comes with a lid), 3 saucepans and a 5-quart stew pot. The lids, however, are glass rather than solid stainless steel and have a vent hole to allow steam escape, which is especially helpful when boiling. The glass also is great for allowing you to see what you are cooking. This set is another induction compatible set and is oven safe to 500 degrees. The copper bottom is the best at heat conduction which means fast preheat and even cooking. Low maintenance despite copper bottom. Will not warp from heat. Though it states its dishwasher safe, to get the longest life out of these pans, stick to hand washing. Notice :1 Free Can of Cleaner Included. The Fleischer & Wolf has a very distinct look with its hammered stainless steel exterior. It certainly stands out from a crowd of brushed stainless steel, but also stands out for its superior cooking qualities. In this set, you’ll get 2 fry pans, 3 saucepans with covers and a 5.75-quart Dutch oven with cover. The dark stainless steel handles look and feel as durable as they are. 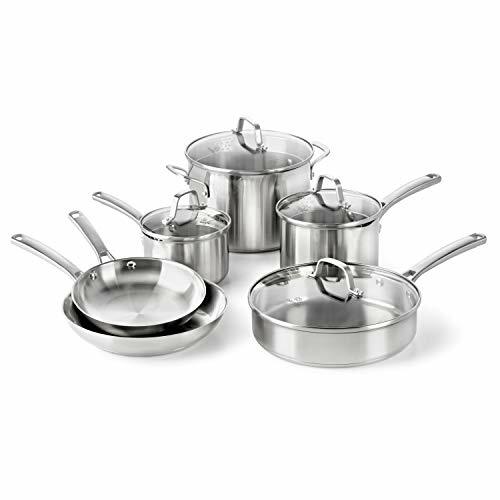 Like the Cuisinart Multiclad set, this set features an aluminum core for even cooking. The price of the set is a little higher than the previous two but still affordable for most people looking to get a whole cookware set. Aluminum core cooks food evenly. Sturdy stainless steel handles are comfortable and durable. This set, unfortunately, does not work on induction cooktops. 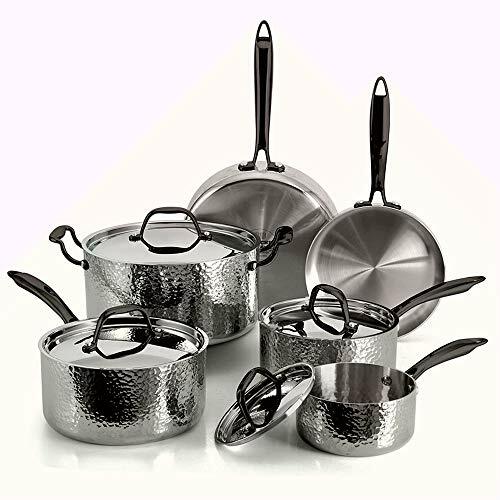 A classy looking set that is durable enough for everyday cooking, this set features a mirror-polish magnetic stainless steel outside and a brushed stainless steel inside ready for any cooktop. The glass lids are heat-resistant and shatter-resistant for some extra peace of mind. The strong cast stainless steel handles have a comfortable ergonomic design. The set is very affordable and comes with 2 saute pans, 2 saucepans with lids and a stockpot with lid as well as a steamer. If you are looking for a smaller set that covers the basics, this set is perfect for you. Beautiful mirror-polish stainless steel outside. Shatter-resistant and heat-resistant glass lids make it easy to watch what you are cooking. Oven safe only up to 350 degrees. 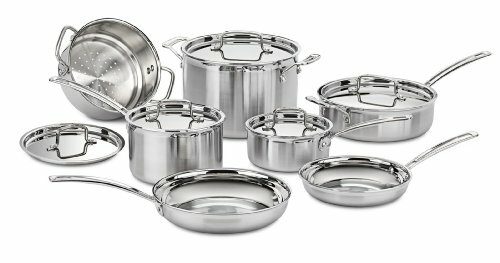 A durable, good looking stainless set that has everything you need to make sauce, stews, and soups galore! 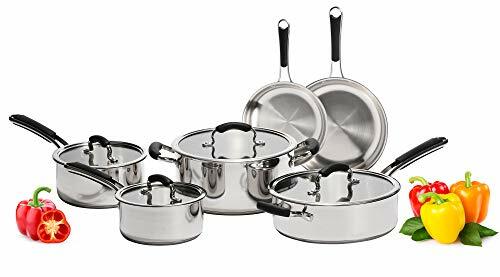 This set comes with 2 sauces pans, a large 8-quart stockpot, a sauté pan with deep sides and a steam insert, as well as lids for everything. This multi-ply set has an inner and outer layer of stainless steel and a multi-element aluminum core. The outer layer of stainless steel is magnetic making it perfect for induction cooktops. The handle is unique in it has a v-shape design, allowing for air to flow through it in order to keep it cool. Keep this pan at low or medium heat only as it may potentially warp if exposed to high heat. Secure-fitting solid stainless steel lids. The entire set is oven safe up to 500 degrees. Doesn’t come with fry pans. 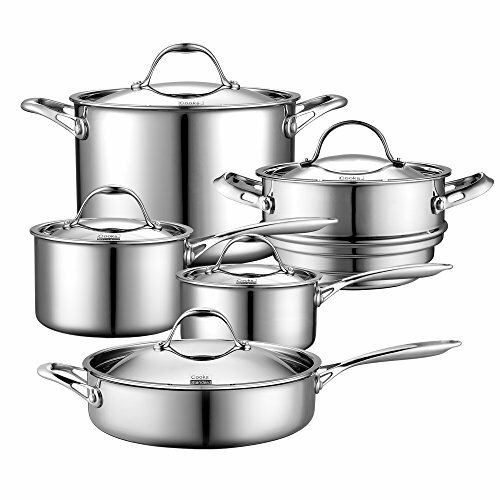 This set will catch your eye with its high polished exterior, solid stainless steel lids, and sleek overall design. But looks aren’t everything, and this set lives up to more than just good looks. You’ll have everything you’ll need in this set which comes with 2 fry pans, 2 saucepans with lids, a deep 3-quart sauté pan with lid and an 8-quart stock pot with lid. The handles on the flat solid stainless steel lid are very durable. Minus the lids, everything in this set is oven and broiler safe up to a whopping 600 degrees! This set looks and cooks good enough for the professionals. The downside? It has a price tag that may scare off some. Beautiful design and sleek high polished exterior. Large set with everything you need. The highest priced set on the list. Not dishwasher safe. Handwash this set! As the name suggests, this is a classic set. Simple, sturdy but attractive design and the lifetime warranty guarantees you’ll have this set for life. With long ergonomic handles and a heavyweight, this set will sit securely on your stovetop. And if you were wondering, yes, that includes induction cooktops. This set comes with 2 fry pans, 2 saucepans with lids, a large sauté pan with lid and a 6-quart stock pot with lid. The lids are glass, so no need to take peeks to see how dinner is coming along— the glass allows you to see what’s going on. And the price? Super affordable with everything you need to cook your next dinner. Ergonomic handles are long and sturdy. It takes a little time to get used to getting the temperature right when preheating. Whether you are in a new home or looking for the basics on a budget, this set will do the trick. It comes with 2 saucepans, a casserole pan, a sauté pan, and 2 fry pans. Lids included for everything except the fry pans. This cookware set features a familiar Tri-Ply construction for even cooking and a fast preheat. To protect your hands, the handles all have silicone grips for safety. While it is oven safe, this set can only withstand 350 degrees. (That means no broiling either!) However, it is another induction cooktop compatible set. Silicone handles for safe handling. Oven safe only to 350 degrees. Easy to clean, easy to cook with and works with all stovetops, the Anolon stainless steel cookware set is reliable and can withstand daily use. You’ll get 2 saucepans, a large saucepot, a sauté pan, a stockpot, and 2 skillets. The deep-seated lids are solid stainless steel and give the set a professional look as well as lock in heat and moisture for better cooking. This is another higher priced set, so for those on a pretty strict budget might want to pass on this. If you have a little leeway with your budget, this might be the set for you. Deep-seated solid stainless steel lids lock in heat and moisture. The handles are a little short. This is on the lighter side, so it might not feel quite as stable as other sets on this list. Also, consider hand washing this set to get a longer life. The stainless steel layer is on the thinner side and may chip over time. In this set, you’ll get 2 saucepans, a large sauté pan, 2 skillets, and an 8-quart stock pot. The price is as attractive as the set is, so low that you could buy a set for yourself and for someone you love. Thick aluminum core cooks food evenly. The lighter weight makes cookware feel less stable. Q: Why is my stainless steel pan discolored? A: If there is a rainbow hue type of discoloration on the pan this happened because the pan was overheated. A trick to remove this is to wash the pan with vinegar or even cook some highly acidic food, like tomatoes, in order to remove the stain. If that doesn’t work, there are special cleaners that will remove the stain. In the future, be sure to cook foods at a slightly lower temperature than the recipe calls for. A: If you look at the bottom of stainless steel cookware you will find two sets of numbers. One will be a pair of numbers separated by a “/” and another three-digit number. The pair of numbers such as 18/8 shows the break down of chromium and nickel in the stainless steel. For example, in 18/8, the first number, 18, is the percentage of chromium while the number 8 is the percentage of nickel. If the number is in the 200s, this is usually a less expensive piece of cookware and tend to be more prone to corrosion. If the number is in the 300s, the pan is a higher-quality and more resistant to corrosion. The most common is 304 stainless steel. If the number is in the 400s, this is usually for cheaper stockpots, flatware and mixing bowls. Q: When should I replace my stainless steel cookware? A: Stainless steel is very durable and is sure to last you for many years. That said, if you choose a stainless steel pan that has a copper layer beneath the steel, and the copper begins to show, then it’s time to replace your pan. Q: Why does food stick to my stainless steel pan when I cook? A: There are two reasons why your food could be sticking to your pan. The first is that you didn’t wait to add oil to the pan after it was preheated. The second is that you are cooking too high of heat. Adjust your heat setting so that you cook at a moderate temperature, and be sure to add the oil after the pan is preheated. If you are looking to make a statement with your cookware, then the Fleischer & Wolf set is the way to go. 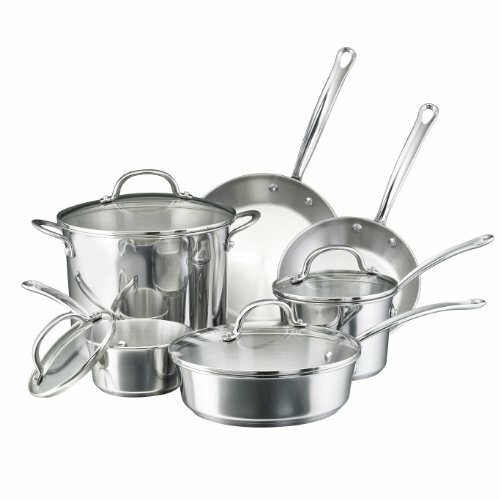 But if you need a classic stainless steel set that will fit your budget, like the Cuisinart set, won’t let you down. All that said, it’s hard to go wrong by choosing any of the sets off the list. The best stainless steel cookware on this list is affordable, super durable and you are sure to get a reliable cooking product no matter which you choose.